A lot of my posts have been about food recently. Rice cakes. Gluten. 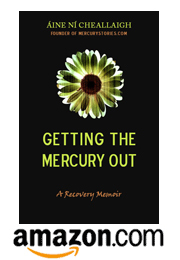 When you’re mercury toxic, food becomes a big issue. Because digestion is a precise ballet, a stack of three-ring circuses all running at the same time in your gut. There are what, four or five organs involved, not to mention the brain and nervous system regulating the whole show, plus all the immune system cells in your gut, and then the whole after-show of your cells trying to absorb and process the nutrients right. Throw a broad-spectrum toxin like mercury in there, and what you’ve got is a hot mess, no joke. When mercury starts messing with your immune system/liver/pancreas/stomach/intestines/hypothalamus/all of the above, finding food that won’t make your body go haywire can be a little tricky. Gone are the carefree days of sitting in a restaurant and choosing food based on the question, What do I feel like eating today? Using only the components found on this menu, create a 500 calorie meal that a) is low in refined sugar b) has at least 300 calories of carbs c) has at least 100 calories of antibiotic-free protein that can’t be tuna, mackerel or any other high-mercury fish. Note that use of even one crumb of gluten in the construction of this meal will result in an automatic fail. Points will be deducted for excess thiols or salicylates. Finding the set of foods that your body can handle, and eating them in the right combinations can be extraordinarily tricky, but it’s worth the effort because it eases so much distress. Instead of grinding and sputtering and flat-out stopping, your machine starts working relatively smoothly. You’re not one of them anymore, those people whose systems have worked silently and perfectly since birth, those people who give you the look that says, Why do you have to be so picky? But eating becomes manageable, as long as you stick like glue to your quirky food plan. Being sick, I was on my quirky food plan for so long, I forgot what eating spontaneously could be like. But I’m better now and I’m beginning to remember. These days, I find myself in the happy position of carefully lifting my dietary restrictions one by one. I eat french fries in restaurants now. My reaction to gluten is such a non-issue, I no longer fret about cross-contamination from other foods swimming in the fryer. And gluten? I totally avoid it, but am I still allergic? How would I know if I don’t ever eat it? Hi Aine. I enjoyed your book. When we live in a toxic world, some “restrictions” are smart for anyone. Our bodies are not designed to have mercury in our teeth, or tobacco smoke in our lungs, or french fries in our guts. PS: When Dr. Kim made his list of the worst things to eat, he’d apparently never visited the Iowa State Fair. At a Hal Huggins lecture years ago, I asked him about his recommendation to eat a stick of butter every day. I asked: How could the human body be well adapted to that, since humans evolved over millions of years but domesticated cattle only 10 thousand years ago? Where did our ancient ancestors get so much butterfat? He looked uncomfortable and answered: They ate fat from other sources. But the question remains: From where? Fruits and vegetables are mostly low in fat, except for nuts and seeds, which are seasonal, not available every day. Wild game and fish are mostly low in fat, and their fat is mostly unsaturated, not saturated like butter. The healthiest and longest-lived human populations known to science ate a low-fat, mostly vegetarian diet. Dr. Huggins has done an enormous public service by educating people about dental mercury. I am grateful for that. However, his ideas about dietary fat conflict with an enormous body of nutritional science. I don’t believe everything he says. Our metabolism can tolerate many unnatural attacks in the short term: amalgams, cigarettes, sticks of butter. In the long term, we lose the war. Aine, I finally had the chance to read your book and I really enjoyed it! Thank you for sharing your journey. It gave me the final push I needed to take care of my own health in addition to my son’s. I have an appointment to get the mercury out of my mouth next month. yay! Oh- and I loved the fish soup “misunderstanding” : ) I laughed out loud because I could identify with your girlfriend, while I know my husband would have done exactly what you did! ha! Thanks, Jessica! I’ll be rooting for you as you go through your detox process. I hope you’ll write about it on your blog. It was so nice to read your last post about all of Aidan’s gains, such great progress!